The MBC Wednesday and Thursday drama “I Do I Do” starring Kim Sun Ah and Lee Jang Woo published a new set of stills on May 15th, 2012. The bold and hot lines of Kim Sun Ah and Lee Jang Woo made the scene full of passion. In the drama, Kim Sun Ah plays the role of a competent and outspoken white-collar female Hwang Ji An, while Lee Jang Woo is playing the role of kind-hearted, nosy and jobless youth Park Tae Kang, going through drastic change in image. 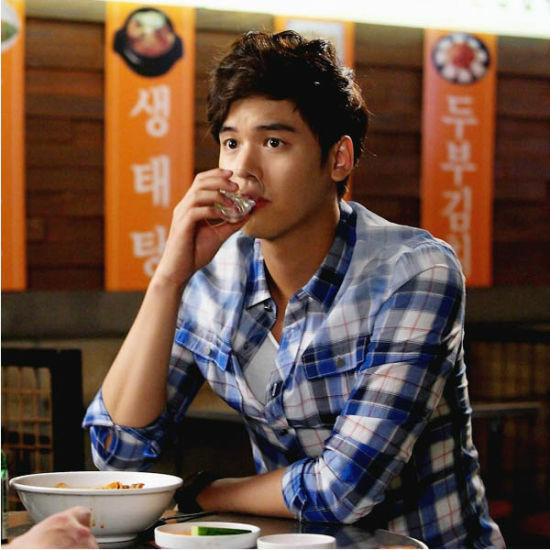 In the drama, Kim Sun Ah and Lee Jang Woo come to the roadside stall operated by friend Shin Sung Hwan (Lee Joon Bae). They drink and pour out their trouble, the lines are bold and hot, drawing laughter. The special wine of “anomalous street vendor”, “no hangover wine” with no aftereffect, “care about me wine” which is good for skin care, “hot passionate wine” specially prepared for love, the bold and passionate names of the wine, making Lee Jang Woo and the whole production team couldn’t help but laughing. Later they created, “wine of been abandoned”, “wine of not filial son also shedding tears”, “raining wine”, “can’t go home win” and so on, the two persons have tacit understanding in cooperation, and the shooting scene is full of joy. “I Do I Do” is a romantic drama that tells the story of shoes designer Hwang Ji An who works day and night and passionate youth Park Tae Kang who is tall, handsome but at loose end working together at the same company and triggers a series of funny events. The drama success “The King 2 Hearts” to debut May 30th at 9:55pm.